Wanting to post something for Mother’s Day, I looked through various Wegenlieder, Berceuses, and skipped past the countless WWI-era soldiers’ songs for their mothers. Eventually, I thought I’d write something related to my own mother. She was a pianist, with long fingers I wish I’d inherited. 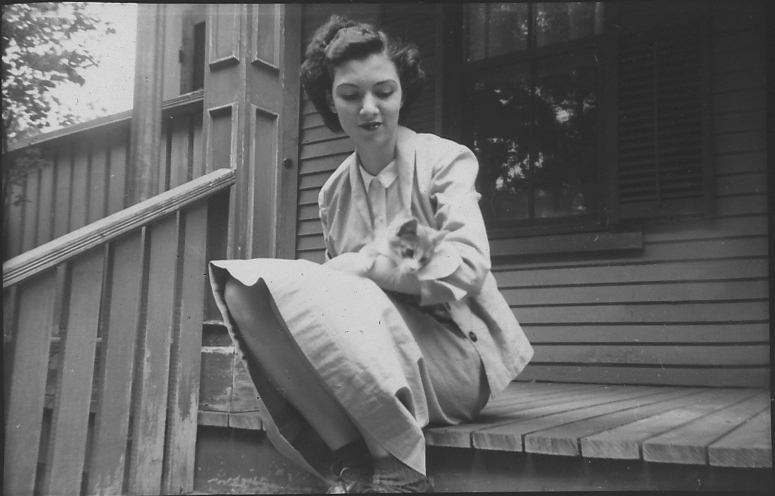 Born Claire Marie Christy in rural Ramona Oklahoma, she was encouraged by her teacher to audition for Yale School of Music. There, she met and married my father. As duo-pianists, Dad practiced in his studio at Connecticut College, and Mom practiced her part, and much solo literature, at home. Needless to say, this is difficult when you’re the mother of four young daughters. I remember playing under the piano during her practice hours, stashing toys in the nooks and crannies; complaining when it got too loud under there or when she went over and over the same passage; watching the fronts of the keys depressing rhythmically and asking questions about what she was doing. In other words, I must have been extremely annoying. Much of the time, I just danced and danced around the room. Next to her books of Chopin, Liszt and Brahms, however, were Songs to Grow On, More Songs to Grow On , and Music Through the Day. Now and then, Mom took a short break from her practicing (or gave me one) to play and sing a favorite from one of the books while I danced and sang along. The first two are collections of folksongs by Beatrice Landeck, who contributed to the latter, as well; all were published in the 1950s. 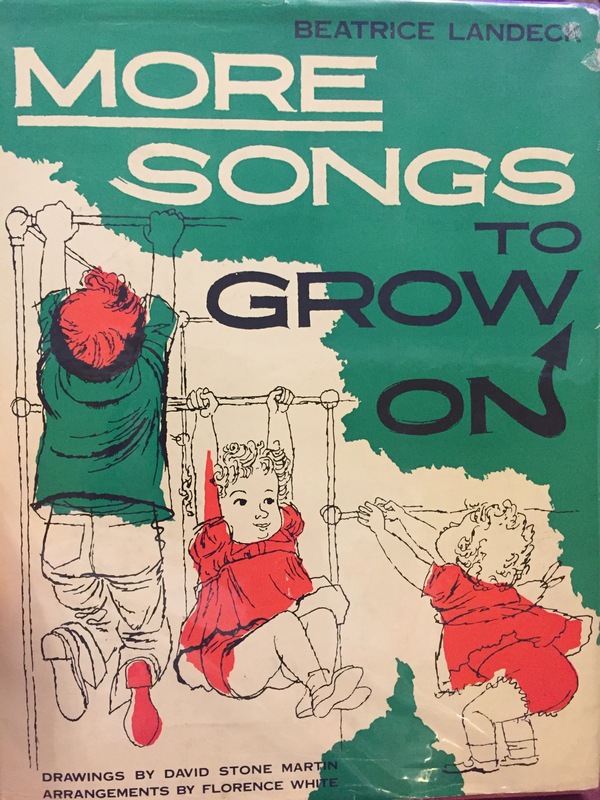 Mom gave me a new copy of Songs to Grow On when my daughter was born, saying, “You’ll be needing this before long.” Years later, I brought the family copy of Music Through the Day to Lucy School, and the children were fascinated to know that Miss Monica sang these songs and looked at the same pictures back in the stone age. She deplores the modern excess of readymade entertainment and makes copious suggestions for music in the home (and elsewhere). Creative spontaneity is the keynote of her theory. Rhythmic games, simple songs even for babies, folk songs with their emotional richness, selective choice of records and instruments for children at each age level, the reading of music even for the uninitiated — all these are treated practically, with enthusiasm, and with careful relation to everyday living. Speaking of lullabies, Landeck chose Raisins and Almonds for More Songs to Grow On. 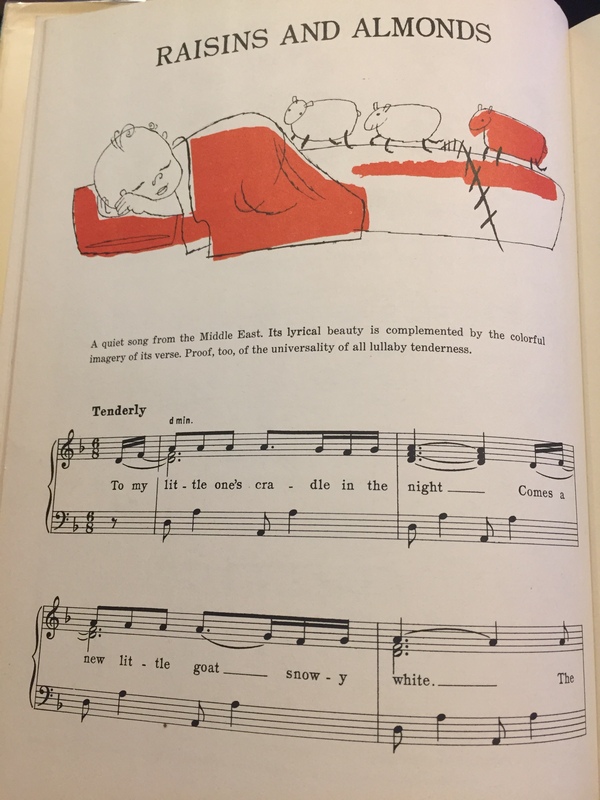 This well-known Jewish lullaby features a haunting minor-key melody, asymmetrical phrasing and lilting rhythms notated variously in 3/4 or 6/8. Landeck’s setting, arranged by Florence White, uses a consistent iambic (short-long) rhythm in the left hand. As an evocation of rocking a cradle, this captures the gentle sense of push, sustain – push, sustain, especially at a slow tempo. The melody is flavored by the augmented 2nd of its harmonic minor. I’m in favor of introducing such intervals in context early on, rather than limiting children’s songs to specific pitches. It’s bittersweet, as Mother’s Day can be. While I can’t post the whole song here due to copyright restrictions, I can provide a glimpse and a score from the Library of Congress.